4 Oct : Left-ruled West Bengal and BJP-ruled Chhattisgarh have emerged as the top states in implementing the Centre’s ambitious flagship programme NREGA for the disabled. According to the latest official estimates, West Bengal has provided work to as many as 29,714 disabled people in 2009-10 followed by Chhattisgarh where 13,763 people have been given work. The National Rural Employment Guarantee Act (NREGA) promises 100-day guaranteed unskilled manual work to every rural adult with an aim to alleviate poverty in such areas. Prime Minister Manmohan Singh, on the occasion of Gandhi Jayanti on 2nd October, announced that the scheme will be rechristened as Mahatma Gandhi Rural Employment Guarantee Act. BJP-ruled Madhya Pradesh has acquired third position in providing jobs to 9,787 disabled, followed closely by Marxist-ruled Tripura at 8,485, Gujarat at 6,994 and Maharashtra at 5,423. Rajasthan, where the highest number of people were provided jobs in the current fiscal, could engage only 2,271 disabled people even as a total of 9,384 physically challenged people registered for work under the flagship programme. Karnataka has provided jobs to a total of 3,722 disabled people, followed by Tamil Nadu at 1,851 and Kerala at 983. A total of 2,680 disabled people have been given jobs in Jharkhand. As many as 4,410 disabled people have been registered for work under the Act in Bihar. However, the state government has so far provided jobs to only 38 of them. Compared to the figures of 2008-09, the statistics of the ministry show an increase in the participation of disabled people under the programme in the current financial year. 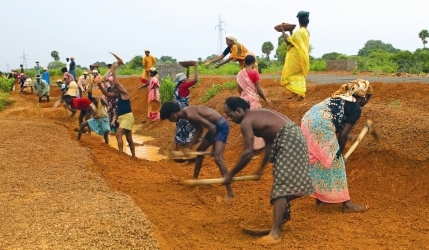 During the financial year 2008-09, a total of 1,46,855 people were provided jobs under NREGA across the country and then too West Bengal was at the top of the list of the states followed by Madhya Pradesh. Vivekanand Technical University Bhilai (C. G.) with 61.85%, in 2008.